Practice more and practice cheaper with handloads that approximate factory fodder. Most reloaders are tinkerers by nature, but we always reach a point where there is one particular gun that we shoot more than others or a particular shooting sport becomes a favorite. When that happens, we don't need to be wasting our time constantly messing around with different loads. We need to find one that does what we want it to do and then stick to it. Very often the solution can be as simple as finding a factory load that works and duplicating it. Of course it is rarely that simple because sometimes we want something that simply isn't available from any factory. Maybe we're cowboy shooters for whom no load is light enough or magnum lovers who can't find one hot enough. Either way--confined only by the limits of safety and common sense--we can usually find something to meet our needs. And those needs are important. A nice light plinking load that shoots great in a revolver may not function at all in a pistol, and if the gun has fixed sights our load must shoot somewhere pretty close to the load for which the gun was sighted at the factory. Gun manufacturers generally choose a standard load and design their fixed sights so they will fire that load to the point of aim. Of course there is a lot of flexibility here, and if the factory picks a 124-grain load for the 9mm, chances are the 115s are going to be fine too. For generations, the standard for the .38 Special has been the plain old 158-grain lead roundnose, but hardly anyone uses that anymore--certainly not for defense. If I had to guess, I'd say that the most common .38 Special defense load would be a 125-grain JHP +P, and this lighter bullet is going to hit below point of aim for some handguns because it's faster and spends less time in the barrel--giving recoil-induced muzzle rise less time to have an effect on it. This phenomenon is most dramatic in short barrels, but as a practical matter this rarely interferes with the defensive use of the gun but shows up on the range. 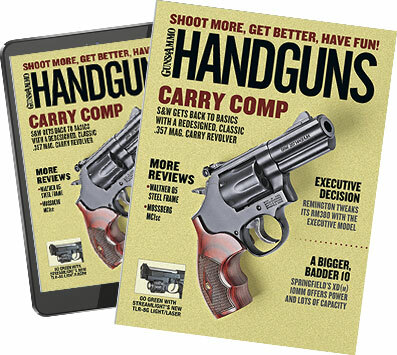 It is the category of defensive handguns where the standard load concept really shines. With the skyrocketing cost of factory ammo, few can afford a really good training regimen without reloading. But there are compromises we can make without degrading training ammo. First of all is bullet selection. Full-metal-jacket bullets are far less expensive than hollowpoints, and cast bullets are cheaper still. The paper or steel target we use for practice could care less, so I strongly favor smacking it with whatever costs least--and that is a cast lead bullet. Some shooters have an aversion to cast bullets that is often based on myth rather than fact. Yes, cast bullets are dirtier, but why care? In my opinion, most shooters clean guns too much anyhow. Yes, cast bullets can be less accurate, but so what? We're not shooting bullseye here, and even if we were, most decent loads will stay in the eight-inch black of the 50-yard bullseye target. On the defensive-gun side, that pretty well equates to making head shots anyhow. While we surely want our training ammo to simulate what we carry for self-defense or duty use, we don't need to clone Hydra-Shok, Gold Dot or SXT factory loads to have good stuff to train with. So what if the velocity is a little less or the point of impact off by an inch or two? If we use the same bullet weight as the duty load, it should be close enough. The exception to this will be found at the outer limits, where the maximum velocity believers dwell. It is not practical to try to match velocities of things like the .357 Sig or the super light .40s with cast bullets because of the likelihood of severe leading. This caution also applies to Glock shooters, who are told not to shoot lead in their pistols. This warning is largely due to the polygonal rifling and might also be applicable to any barrel of that type, although in this case rigorous cleaning and moderate loads seem to suffice. When we talk about duplicating factory ammo for training purposes, it turns out that we really do not need to interpret that very strictly. The real key is whether or not the individual shooter can discriminate between relatively small changes in velocity and recoil. I always thought that average shooters would be able to tell the difference between, for example, standard and +P loads, but I did a blind study with a group of shooters who were randomly given 1911 pistols loaded with either standard or +P loads and asked to tell which was which. Eighty percent could not. If that is the case, I can't help but wonder if our training ammo really has to be exactly the same. I am a big fan of cast bullets because of their significant economy, but we often hear that one should not shoot them in automatic pistols. However, with the exception already mentioned, modern pistols are very tolerant and function well over a very broad range of weights and velocities. You may remember when the gospel was that we must use lighter recoil springs in 1911s if we wanted to shoot target loads, but I routinely shoot loads equivalent to the bullseye ammo of years past, and the guns run just fine. One genuine concern is to find a load that shoots to the same point of impact as our duty ammo, and that can be an issue since most "service" weapons have fixed sights. I've known intuitively that in most cases this isn't hard to do but set out to document it at the range. I chose to use three representative duty guns--S&W M&Ps in 9mm, .40 S&W and .45 ACP--and appropriate duty ammunition: Federal 124-grain Hydra-Shok in 9mm, Winchester 180-grain SXT in .40 S&W and Remington 230-grain Golden Saber in .45 ACP. Then I arbitrarily selected starting and maximum loads for comparable cast bullets in each caliber. There was no load workup here. I just took data and let velocity fall where it wanted to. None of the guns malfunctioned with the lighter load, nor did any show signs of leading. If we use standard law enforcement qualification courses as a guide, few shoot at ranges beyond 25 yards. Because my experience suggests that a range of 15 yards is where most shooters begin to show accuracy problems, I chose to set up a drill using standard bullseye targets at that range. I did not try for precise accuracy but used a center hold and shot offhand at a rate that would meet qualifying time limits--just a little faster than the bullseye rapid fire pace of five shots in 10 seconds. came the lighter handload, followed by the heavier load. I did the same for each of the three guns, and when all was said and done almost every shot was within the original circle drawn for the factory ammo. This established the fact that it is not necessary to duplicate velocity precisely to have acceptable accuracy at combat ranges. Even at 25 yards differences were very small. When we talk about handguns with adjustable sights it's really a different ballgame. My recreational shooting is largely done with 1911 type pistols or S&W revolvers, all of which have adjustable sights. None are used in any defensive context, so it is simply a matter of finding an acceptably accurate load. In my case those are in the "target" velocity range of 750 to 850 fps and are almost always shown as starting loads in the manuals. Even though powder may be the least expensive part of the reload, it is still an expense to manage, so unless I need the speed, light loads rule. A standard load can be anything you want it to be because nobody else can set your priorities. If you just want a comfortable plinking load, you could do worse than taking a recipe from any standard reference that shows the components you want to use and take the starting load. Then load 50 rounds and go shoot them. If the gun works, and you don't shoot worse than usual, your problem is solved.